When buying my house I vowed to be as transparent as possible. 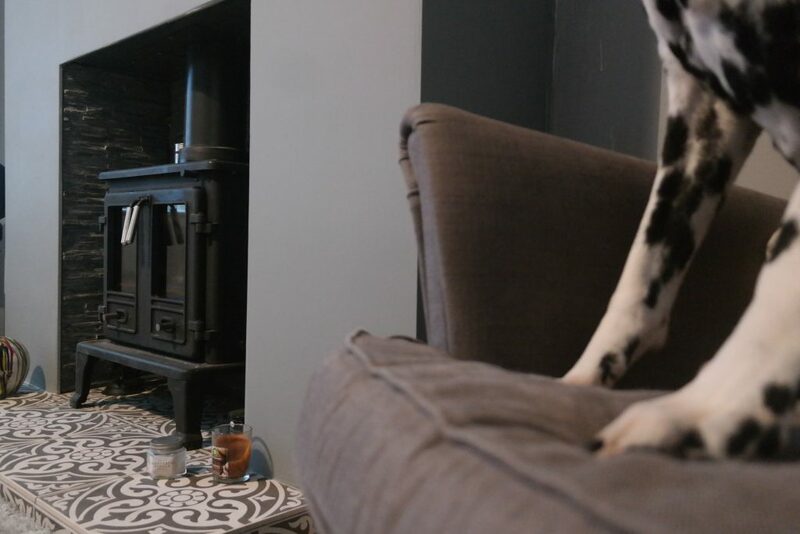 I want to talk all about the realities of being a homeowner and that includes telling you when I skint myself stupid to install a pretty log burner or how it feels to live paycheck-to-paycheck, barely scraping by. 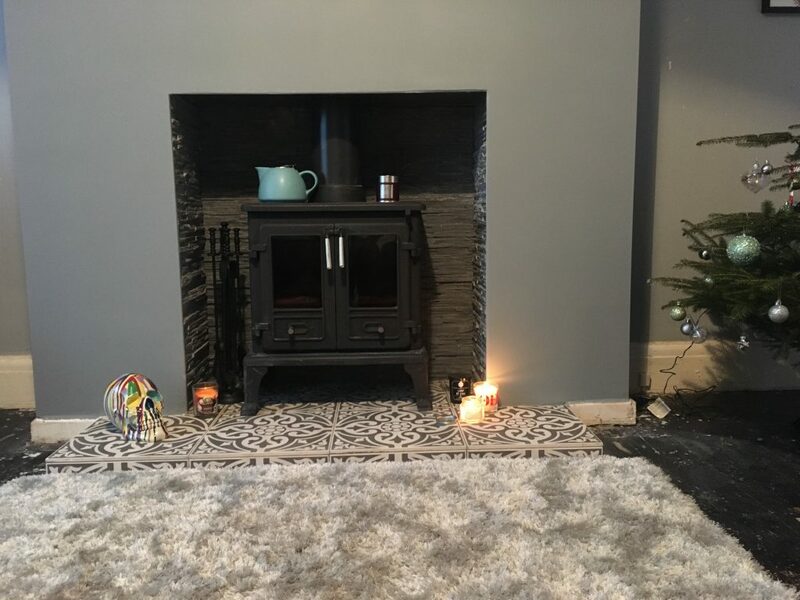 On the bright side, that means you get to read all the nitty-gritty details of buying a house along with a blog post all about transforming my front room with a log burner! When moving into my house, the interior styling wasn’t quite to my taste. It was the kind of place that you could happily live in if you were renting. There weren’t any glaring issues, there was no damp and there was no severe immediate fixes. It was ready to walk into. Knowing that I wouldn’t be able to afford to renovate the whole house right away this was an absolute blessing. With that said, being the impatient new homeowner that I am, I was still itching to stamp my mark on the house and so out came the wallpaper stripper and up came the carpets. When moving into my house, the front room featured a brown leather panel chimney breast with brown wood-effect alcoves opposite a wall with little blue houses and the remaining walls were all painted blue. Oh and the carpet was brown. Admittedly, it isn’t a look I personally would choose when decorating my own house. So, the first thing I did as part of my front room transformation was strip the brown wood-effect and leather panel wallpaper off the chimney breast and alcove walls and paint the blue walls a neutral, safe white (though these will later be grey). 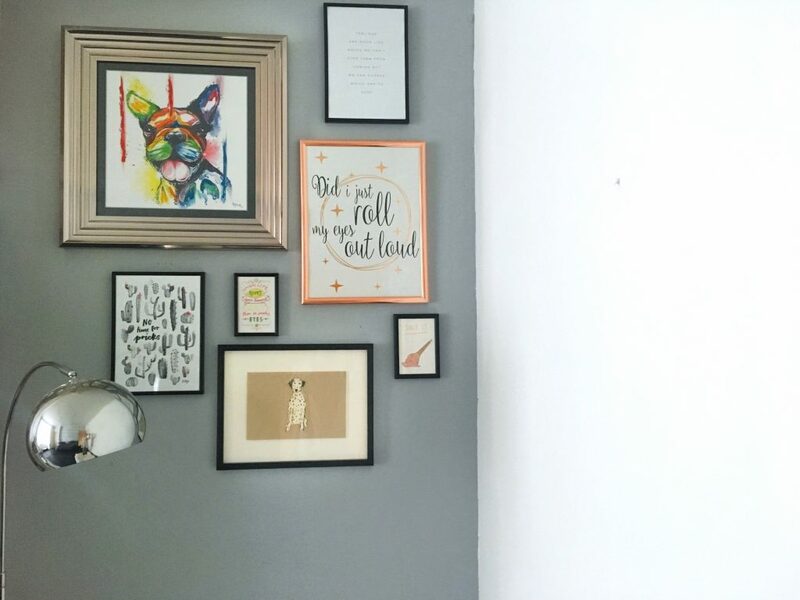 I’d already decided that I wanted my front room to have grey base tones which would add a cosy feel to the room and allow me to add different textures and pops of colour with homeware accessories and furniture. Knowing that I wanted grey, I scoured the gorgeous colour charts of Little Greene Paint Co until I found the perfect two shades for me. Honestly, there were far too many shades of grey on Little Greene Paint’s website that took my fancy. The two colours I settled on were both in the Colours of England range, which I hoped would capture the Victorian heritage of my little 1920s home. For the alcoves I chose Mono; a refreshing light blue-grey shade. I wanted to paint the alcoves a lighter colour to add depth to the front room, especially when paired with the Mid Lead Colour matt emulsion paint on the chimney breast. This darker grey still has a hint of blue to it meaning it paired perfectly with Mono. I always thought paint was just paint, y’know? I never really understood the difference between brands or why someone might pay double the price for the same shade but by a different brand. Since using Little Greene Paint Company paint, I can now whole-heartedly say I understand. This paint felt as though it literally glided on the walls. One thin coat of paint did the trick at covering the walls. It meant a small 2.5 litre tin of paint easily got the job done and I had lots of paint left over for future DIY jobs. Whilst in the midst of painting the alcoves the light Mono grey, I was trying to decide what to do with that less-than-pleasant fireplace. I knew that no matter what colour I painted the walls or furniture I filled the room with, that fireplace would niggle at me. It’d never feel like it was my front room. After lots of umm-ing and ahh-ing, I made my decision. I would rip out the fireplace and install a lovely log burner instead. 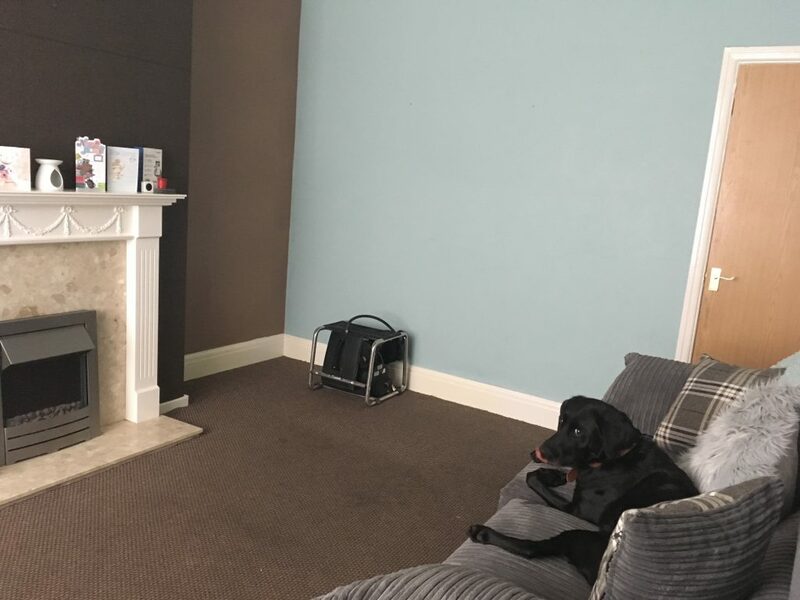 The log burner installation didn’t happen until October so I lived with a stripped-back chimney breast and unwanted fireplace for a few months but eventually the chimney breast was painted in the Mid Lead Colour paint to add that extra depth of grey to the living room. Before throwing my money at someone to install a log burner, I did my research. I wanted to be absolutely certain that I was getting exactly what I wanted. After all, I knew it wasn’t going to be a cheap job. 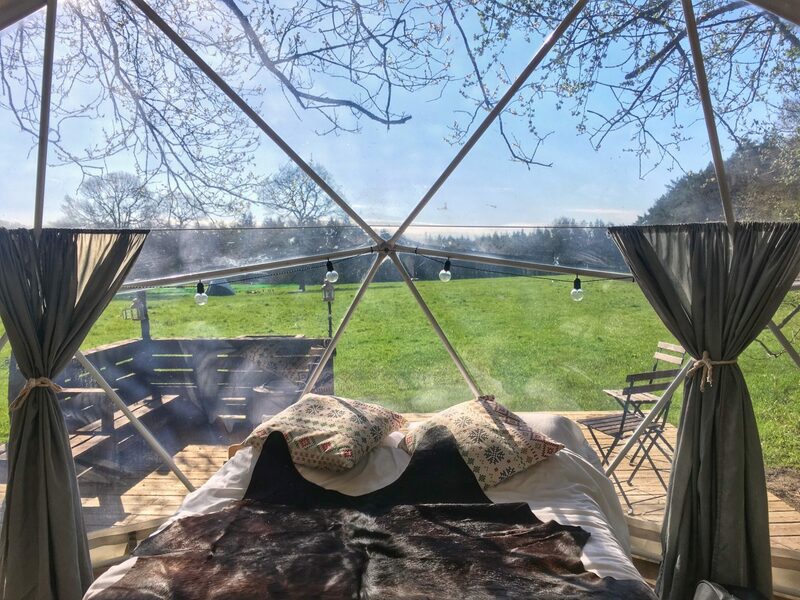 I scrolled through Pinterest for hours each day, staring longingly at log burners to inspire my own log burner installation. As my chimney breast is quite wide, I decided a double-door log burner would look the most natural in this space. It’s worth noting, when choosing a log burner to pick one that has the right heat output for the room it’s intended for. Also, bear in mind that a bigger log burner will require more time and fuel to heat. Many log burning stove websites will have a heat output calculator, along with recommended wood burning stoves, to help you make the best informed decision. After much deliberation, I chose the Firefox 8 Twin Door multi-fuel stove. 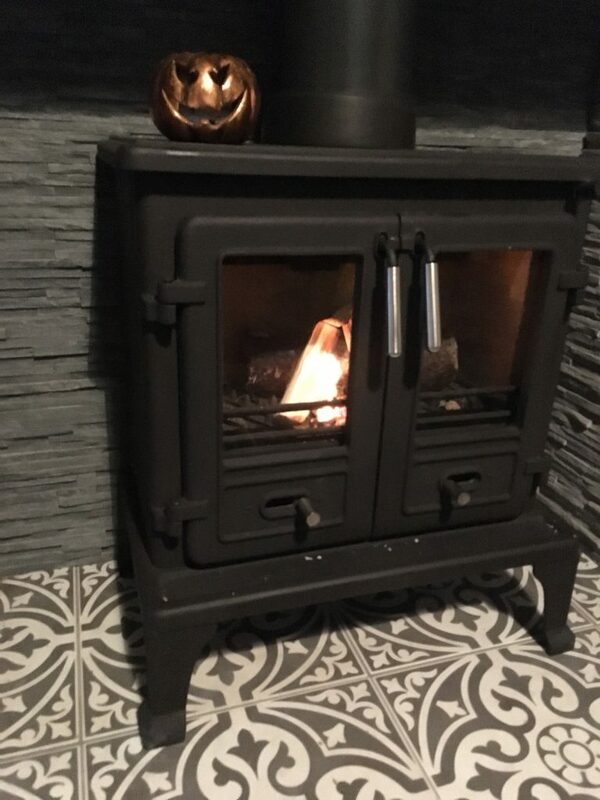 Knowing I wanted a twin door stove, this seemed like the best choice and having a multi-fuel burner would also mean I’m not restricted to just burning wood. Plus, it was reasonably priced at around £400 and had good reviews. I really wanted my log burner to be a focal-point of the front room. After all, it wasn’t going to be a cheap feat so I may as well make the most of my investment. It wasn’t just the log burner that I had to think about. I also had to consider what I wanted to do with the chamber and the hearth. With the rest of the front room being grey and rather plain, it was the perfect opportunity to have some fun with the front room. It only took a few minutes of looking on the Tons of Tiles website to find the perfect tiles for my hearth. 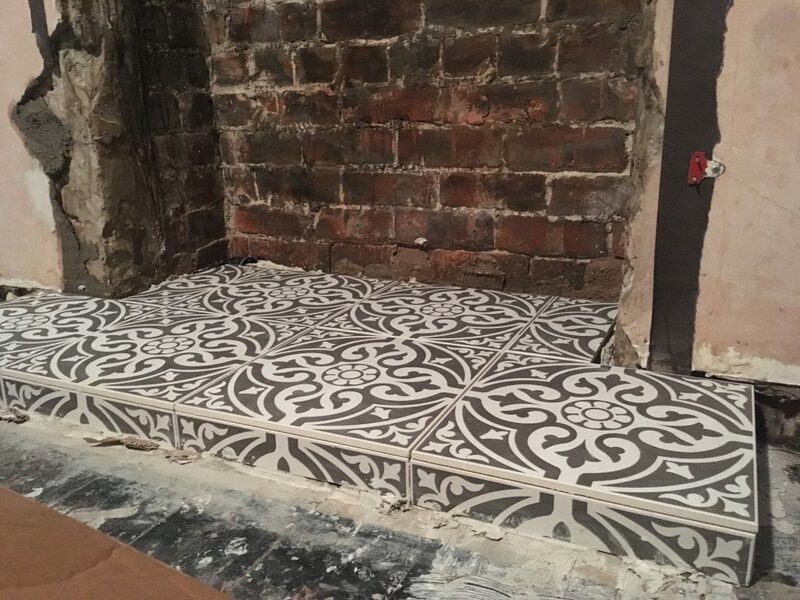 The Devon Stone Grey feature tiles couldn’t have been more perfect – with grey tones to fit my grey room and Victorian styled pattern to add character to my Victorian home. As soon as they arrived, I was in love and immediately started picturing how the little nook at the end of the house would look with these. So, it looks like that’s now another renovation job to add to the ever-growing list for the future. As for the chamber, I toyed with the idea of just painting it yet another shade of grey or having exposed brickwork. But then whilst I was at a stove showroom trying to find the perfect wood-burner, I spied the slate chambers and instantly knew that’s what I wanted. The rough texture of the grey slate added yet another touch of character to my living room. I also chose an oak beam to run across the opening of the fireplace but being the idiot that I am, I bought a beam that was 1ft too short and now I’m stuck with a £90 piece of wood I can’t use and no mantelpiece above my fireplace. Surprisingly, finding a tradesman to fit my log-burner wasn’t as daunting as I thought it would be. Normally, it’s hard to find a tradesman who’s responsive or reliable but this guy couldn’t be faulted. The whole time through the process of choosing everything that I wanted to getting the job done, he was brilliant. 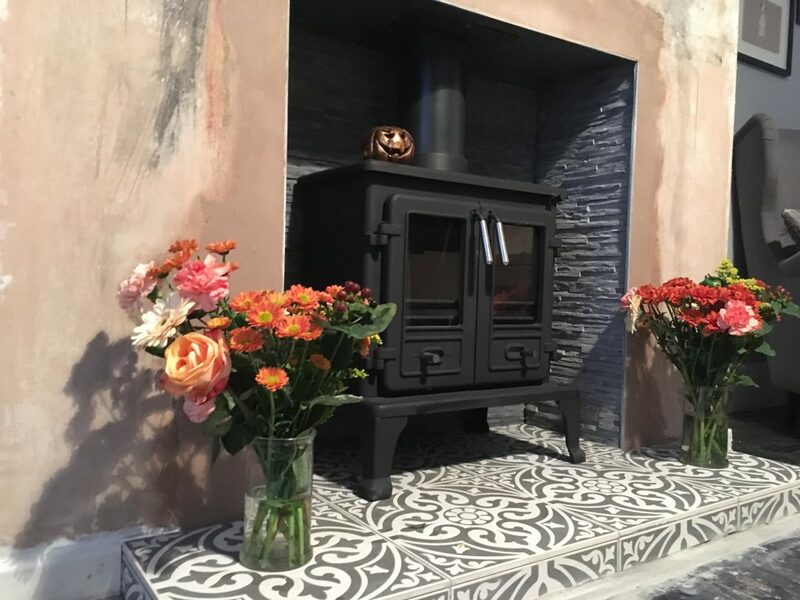 For the full-installation, including the wood-burner stove that I wanted, the slate grey chamber and the tiled hearth, I paid a more-than-reasonable £2,350. Obviously, if I had gone for a smaller log-burner and cut out the extras like the chamber and the custom hearth, it would have been even cheaper. 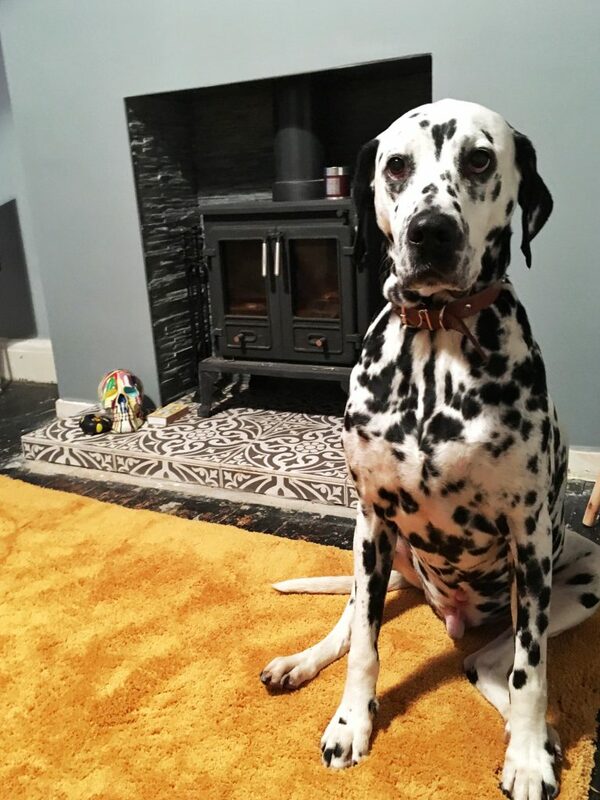 If you’re based in the North-West and ever looking for a HETAS-registered heat engineer to install the wood burning stove of your dream, I highly recommend Fireside World. Eventually, I plastered the chimney breast and painted it the gorgeous Mono. When it comes to DIY, I’m a slow worker and I avoid doing it for as long as possible. But my front room is now almost complete! I mean, I just have to sand and re-paint the skirting boards and coving; lay new flooring; buy and mount a TV above the fire; fit new doors; buy new blinds; hang a mirror and then it might actually be complete and presentable for guests. But, I’m now incredibly poor so it’ll be a good few months before any of that happens. Until then, you can expect to see just this tiny corner of my home! Regardless of how poor I may be, I’m excited to slowly see my house come together and look like my dream home.